At this point in the build we seem to be faced with two separate and equal goals. The first goal is to have a rolling chassis. We're only a few steps away from this, and almost none of those steps requires any sort of miracle to occur. Just a little welding on the rear suspension, a connector shaft for the steering, and a floor. After that, we rebuild the front hubs and the rear brakes, attach the wheels, drop in the engine, and weld up the motor mounts. Then we take a bunch of pictures and everybody's happy. The second goal involves getting the frame ready to paint. This requires a ton of hard work, including lots of grinding and welding and making new parts like the spare tire carrier and roll bar. 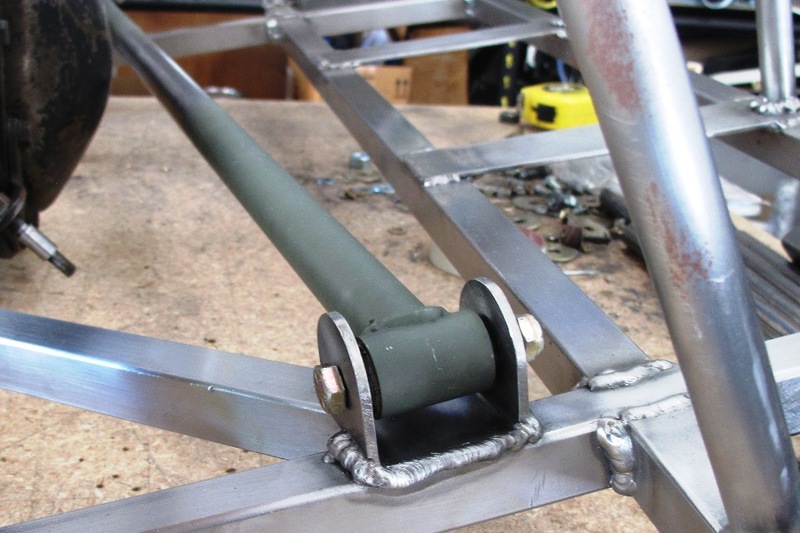 All of the open tubes on the frame need to be closed off, all tack welds need to be fully welded, and a whole raft of weld beads need to be sanded down. Nobody's happy about any of that. It'll take a long time, it won't be fun, and any pictures we take will be boring. Still, this is obviously the practical goal. Luckily, nothing about building a car from scratch can be considered even remotely practical, so we're going for the rolling chassis. Excellent. One thing, though. Earlier, when we said we only had a few steps left, we actually meant 30. But that's still okay. It's relatively few in the grand scheme of things. A week or two at the most. Maybe five. The first step is connecting the steering wheel column to the steering rack column, using a pair of MGB universal joints and a 10" length of steering shaft material (a.k.a. steel) that we ordered from Summit Racing. 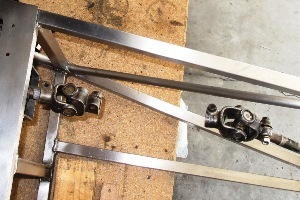 The shaft is splined on each end, as are the U-joints, so we figured hooking everything up would be a snap. 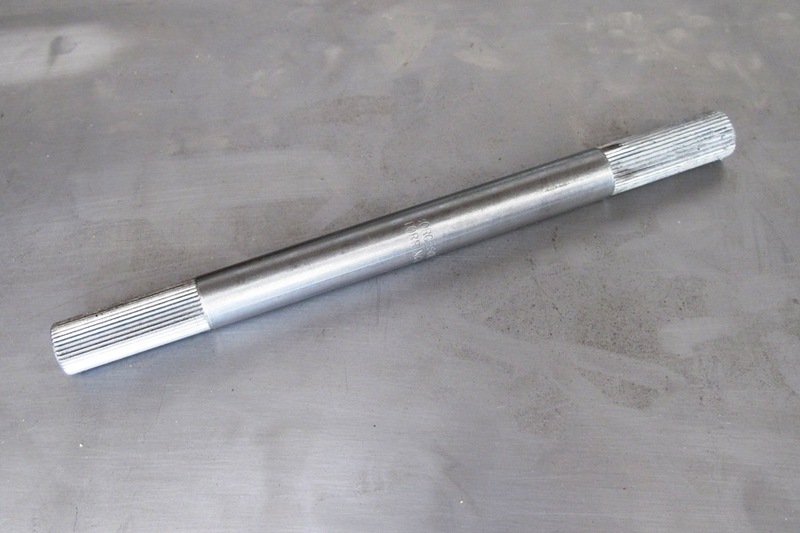 However, for some odd reason, the company that manufactured the U-joints and the company that manufactured the connector couldn't manage to agree on how many splines would be optimal for a steering column. The Summit part had just 36 splines, which was apparently too few for the Brits. So we ordered another connector, a 48-spline model. We didn't actually count the number of splines on the MGB column, because for one thing they're way too tiny, but 48 looks about right. 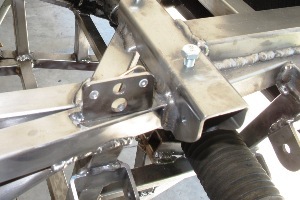 In any case we won't know anything for sure until the new connector arrives, and so at this point we had no choice but to move on to step two, which was to shorten the Panhard rod and weld on the bracket that attaches the rod to the frame. To get the proper length of the Panhard rod, we had to use the old rear axle attachment bracket, because we haven't had time yet to weld on the new one. That's actually step 23 of the 30. But the difference in length between the old attachment and the new one is probably only about a millimeter or two, and the bar is adjustable, so we should be okay. Not that this sort of thinking has always worked flawlessly in the past. But it doesn't matter now because the Panhard bracket is welded solidly to the frame on all four sides, and it's not going anywhere. 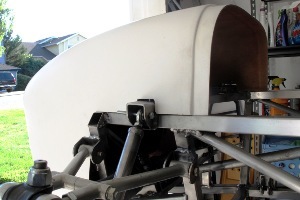 Step 3 of 30 involved attaching the fiberglass nose cone to the frame. You might think that a nose cone isn't an essential part of a rolling chassis, and you're probably right about that, but you can't argue that the nose makes the chassis look a lot more like a car. So we're doing it. And the first thing we did in that regard was put on our hazmat suits so we could trim the nose to fit over the suspension. Over the years, one thing we've learned in situations like this is that it's best to trim off a little more material than you think you need to. A lot of that clearance will get used up. How it gets used up is a mystery, but it happens, and there's nothing worse than carefully trimming a part, and after it's all finished and painted and ready to go, it doesn't quite fit any more. In the end, a sixteenth of an inch of clearance is a good look for any car, so we're going to start with a little more than an eighth of an inch. Trust me, it'll work. To actually attach the nose to the frame, we're using Dzus fittings, per the book. 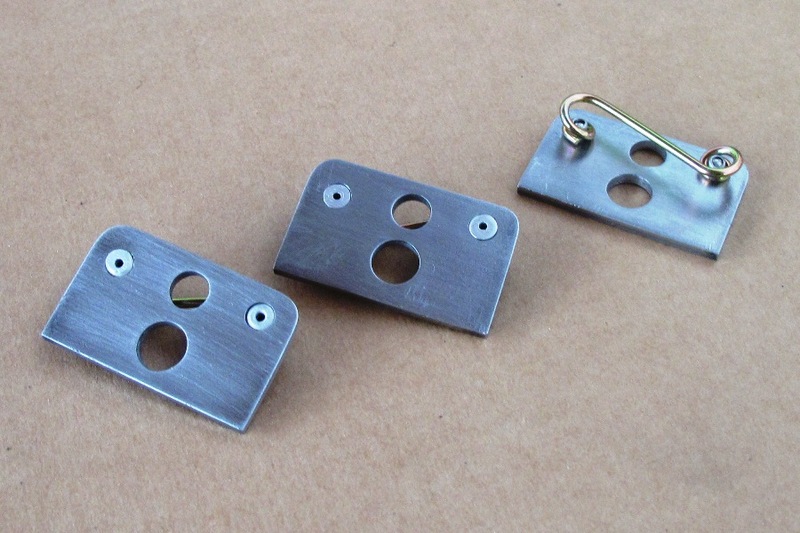 We made up some tabs for the Dzus wires using our standard 1/8" steel plate, which we're certain is a first in the automotive industry, where even 16 gauge steel is considered overkill for this sort of application. But we tried dimpling 16 gauge steel for the rivets, and the results were truly unfortunate. Countersunk 1/8" steel looks way better, and any weight penalty we might incur is completely overshadowed by the pounds of useless weight we've already added to the frame. We next drilled holes in the nose, attached the tabs to the nose with Dzus fasteners, and used the whole thing as a jig for locating the tabs on the frame. We were only marginally successful with this, because for one thing it was extremely difficult to get a MIG torch in there to tack weld the tabs to the frame, and for another we're just not very good at this sort of thing. But we tack welded the tabs as best we could, and afterwards, when we removed the nose, the nearside tab looked okay but the other one looked kind of askew. Althoiugh not askew enough to keep us from fully welding it in place. Which we did. And now the nose fits perfectly and it looks good and all, but when you take the nose off that tab couldn't stand out more if it was painted lime green and had a big red arrow pointing at it. Maybe that's not a big deal to you, but we have a feeling that crooked tab is going to bother us for a long time. But now we have to move on, because we still have 27 more steps to go. We actually have all of the steps figured out, but we don't like to see them all at once so we're not going to list them here. But we'll talk about them as we go, and maybe you can count them down along with the rest of us.